The double dividend argument makes environmental tax reform (ETR) an interesting and attractive policy instrument for sustainable development and environmental policy. ETR has been implemented, at least, by six EU member states by now. These countries have shifted the tax burden from taxation on labour to taxation on carbon/energy. However, all the theoretical advantages of ETR have not been realised and there have been barriers to further adoption of ETR. Thus, the policy process in which the instruments are selected and implemented is of crucial importance. The aim of this paper is to examine this policy process through a case study. The focus will be on the role of NGOs. In Finland, there have been two main policy processes on ETR. One of them ended up to implement a tax shift in the years 1997 and 1998, when the energy tax rates were increased in order to compensate the cutting of labour taxation. Next time ETR was introduced as a tool only in the Government Platform for the years 2003 to 2006. However, in spite of the commitments in the Platform no new environmental taxes were introduced during that government rule, nor the rate of energy or other environmental taxation was increased. Thus, the outcome of the second policy process on ETR (2003-2006), was that ETR will not be implemented. Why in one case the policy process ends up implementing a tax shift, and in other case not to implement it? What kind of a policy process has there been on ETR? What have been the factors affecting the instrument choice? How have the advocacy coalitions formed and changed over time? What has been the role of NGOs in the policy process? These are, among others, questions to be addressed in this case study. In the paper, I will focus on four issues. Firstly, I will specify the main actors and advocacy coalitions, which have participated in the policy process on ETR. Secondly, I will take a closer look at the main features and elements of the policy process. Thirdly, further analysis is done on arguments used in the policy process and factors affecting the instrument choice. Fourthly, I will conclude by assessing the role of NGOs in the policy process. How have the NGOs participated in the policy process? What kind of methods and tools have they used when trying to affect policy process? The research material contains administrative and political documents concerning environmental tax policy and 25 interviews. The theoretical framework is based on the advocacy coalition framework together with the policy instrument choice theory. The financial support of Maj and Tor Nessling Foundation and the Finnish Cultural Foundation is gratefully acknowledged. CO2 taxes play an essential role in preventing global warming. In Switzerland, implementing a climate tax encountered remarkable resistance. The schnar.ch project was a creative and successful initiative to overcome opposition. In 2006, a process to implement a CO2 tax in Switzerland which had already been going on for several years was up for a decision. Evidence suggested that the initiative would fail in parliament. If that were to happen, there was reason to fear that no new approach could be successful for several years. So a group of concerned people took action and started the schnar.ch campaign, managed by the Swiss Association for Environmentally Conscious Management. In Switzerland, citizens writing letters to their representatives in parliament is not common practice. Schnar.ch is a website enabling citizens to communicate their opinions to decision makers. Designed as a neutral platform, schnar.ch itself does not transport an opinion. Accurate information about climate change, explanations of how different political or private climate change measures work, as well as the history of the decision process concerning the CO2 tax constitute one of three pillars of the website. The site also includes a list of supporting organizations and companies, and issue-related statements from various stakeholders. The second pillar and central element is the e-mail generator: Visitors can select their own representatives from a list which includes the parliamentarians’ names and party affiliations, and then ask a question or submit a comment, which is transmitted by e-mail and at the same time published on the website. The parliamentarians can respond directly by replying to the e-mail, and the answer is displayed next to the question on schnar.ch. The third pillar is a series of motivation and marketing elements. 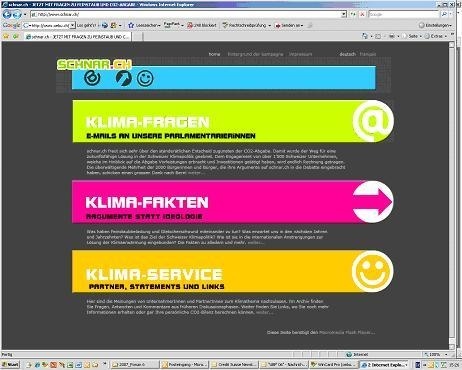 “Schnarch,” the name of the website, is the German word for “snore,” and the weekly award for the laziest parliamentarian (with the most unfavourable ratio of questions to answers) was an alarm clock, illustrating the campaign’s intention of rousing people to climate change. A raffle was organized for the citizens asking questions, the first prize was a guided excursion on a glacier. The reward for the parliamentarians: for each answer “from Berne,” ten centimetres of hedge were planted in a Swiss nature reserve. Over two thousand e-mails were sent within the four weeks of the first round of our campaign. Combined with direct lobbying in parliament immediately before the vote, schnar.ch made its point: citizens want to be heard, and they demand their representatives’ accountability concerning climate change policy. The Swiss political system required two more votes within the next few months, both were transformed to a positive outcome: we won the match. The schnar.ch website continues, and now also links climate change with other current environmental issues such as fine particular matter. While most green taxes target byproducts downstream - i.e., pollutants - one fundamental green tax targets inputs upstream - i.e, sites and natural resources. Such a more fundamental tax would fall not on a business' profit or operation, since doing so makes the business less efficient and hence more polluting. Instead, this kind of levy would fall on the firm's extraction of natural resources. Nor would a more fundamental tax fall on a owner's building or other improvements, since doing so penalizes owners for erecting structures of maximal beauty and efficiency, again wasting resources. Instead, it would fall on the owner's land, on the value of the location, steeply highest in downtowns or over oil fields. Having to pay these "land dues" impels owners to put their sites to highest and best use, in metro regions resulting in contiguous buildings, which saves energy. Plus, recycling urban sites with new buildings speeds up the gain from stiffer building codes that require new buildings to have more insulation, light tunnels, heat exchangers, no parking space for cars, etc. Throughout the region, the new in-fill reduces sprawl and makes cities more compact - ideal for walking, biking, and mass transit. As in Hong Kong, a transit authority could recover site values around its transit stops in order to fund its operations; hence Hong Kong can operate its mass transit without even one penny of subsidy from the general fund. And all the well-situated new development employs people in construction, and as those workers spend their earnings, that grows the local economy in healthy ways; when New Zealand taxed land, employment averaged 99%. Compared to taxes on pollutants, this tax on land or dues for exclusive use of land gives society "more bang for the buck". (1) By encouraging owners to use land efficiently, it reduces downstream pollutants from transportation or from individual buildings separated from others. (2) By reducing counterproductive taxes on owners and companies, it allows more economic interaction, which raises local site values and augments the local base - just the opposite of a successful pollution tax which diminishes its own base (as well it should). (3) Since in most nations, it's local government that levies the tax on land or building or property, activists for green taxes can advocate locally, and some locales offer less resistance to green progress than do some national capitols. And (4), when advocates propose that the value of nature - the rent for sites and resources and EM spectrum and ecosystem services - should be recovered and shared, we imply that Earth belongs to everyone. It's an old moral tradition, one largely forgotten, but one that must be resurrected if the struggle to sustain human civilization on an inhabitable Earth is to be won. Here in Oregon, we make all these points to groups that already support the environment in general. In the last three state legislative sessions, we have had bills to allow localities - cities, counties, or metro regions - to shift their property tax if voters so desired. With elected officials, we do not stress the ethical argument so much as we emphasize the efficiency argument. This two-pronged approach of reaching out to activists with the bigger picture of belonging to Mother Earth and reaching out to legislators with encouraging results from a couple dozen places that have shifted their property tax has so far not generated sufficient critical mass to move our bill along the legislative process. Since the process is slow even for bills that eventually win, we cannot be sure if our strategy is sound or if we should try to make the moral issue of sharing Earth into a popular issue with everyone, including activists, politicians, and the lay public. We use the 5M Method of Moving Society to Change: Message (finding words to express new insights that resonate with a critical mass of society), Members (growing the ranks of our volunteers and minor donors), Money (raising funds from members, the general public buying T-shirts, attending events, and from major contributors), Media (not just op-eds and interviews but also T-shirts and documentaries), and Mission (ultimately getting tax shift into law). Since the 5M Method has worked for other paradigm shifts - such as the birth of environmentalism itself - we may be on the right track but just need more time (and since time is money, more of that, too). One solution for the well-known ecological and economical problems of the transport sector, due to its high dependence on crude oil, could be an increased usage of alternative engines and fuels for cars. Some of these alternatives are already introduced into the market. Yet, to a very tiny share. two of the reasons for this are a lack of knowledge about those alternatives and the higher investment costs for applying them, compared to petrol/diesel. These investment costs, however are amortised by lower operating costs in some alternatives. The aim of this study is to analyse the possibility and effects of promoting adequate, more economical and ecological alternatives to petroleum/diesel by a local supporting-programme in the city of Cologne. One part of this supporting programme is free-of interests credit programme to cover these higher investment cost. The credit is repaid with the savings earned by the lower fuel costs. The other part consists of a communication campaign to increase familarity with those adequate alternatives and participation in the credit programme. Any alternative has to fulfil certain criteria in order to be included in the supporting programme. Can the alternative fuel or engine be applied by the individual car owner/user? The focus of the Local Agenda 21 process lies on participation of the citizens. Therefore, only alternatives which could be used by the car user or car owner, and not just by mineral oil companies, are considered. Does its application lead to higher investment cost and also to lower runninng costs, which is a precondition for the free-of interest credit programme to work? Is the necessary infrastructure for applying the alternative available in the region of Cologne? Compared to diesel/petrol, does its application lead to lower energy input and greenhouse gas emission? What about the emission of local pollutants, such as nitrous gases, sulphur, particle and also noise? Is the alternative sustainable, concerning the interaction of social, economical and ecological aspects and also future prospects? The paper also describes possible ways of implementing this supporting-programme and identifies potential difficulties which might appear, as well as the expenditures and efforts for the credit provider.